The couch, fast food, and Dancing with the Stars: Dinnertime on ABC’s The Middle. When it premiered in September 2009, ABC’s sitcom The Middle received overall positive ratings for its relatable situations, eccentric humor, and down-to-earth tone. More recently, critics have applauded not only Atticus Shaffer’s portrayal of 11-year-old Brick Heck, but also the show’s running commentary on our current dismal economy and skyrocketing unemployment rate, incidentally something for which the slightly more popular and hipper family sitcom Modern Family has recently been criticized. Still, some reviewers pan The Middle for its supposedly stock characters and clichéd sitcom situations. For example, one critic reports rather bluntly, “If you haven’t met these characters before, you don’t own a TV.” On the surface, the naysayers have a point. The family is normative (white, heterosexual, married, church-going); the parents are stressed; the kids are quirky; and the situational comedy often revolves around conventional family tiffs and misunderstandings. A closer look at The Middle, however, reveals that it is forging new territory, at least in terms of the representation of men in the working-class domestic sitcom. 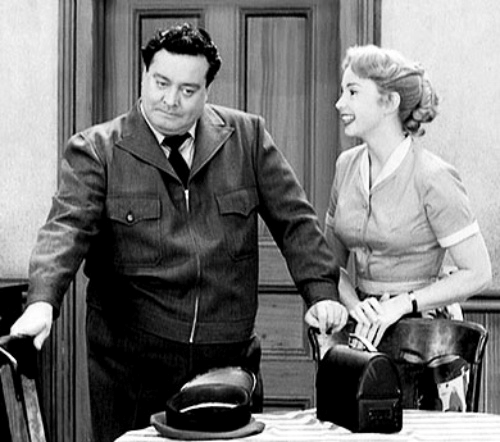 The Honeymooners’ Ralph Kramden, the original working-class buffoon. Thanksgiving dinner, served up by Mike and the rest of the Heck clan. So why this shift? Why would The Middle move away from the buffoonish male stereotype that the working-class sitcom has perfected over half a century? Why would it bestow traits of the middle-class sitcom father — self-assured, admired, competent — on its blue-collar character?7 Three words: the current economy. The Middle is the only working-class situational comedy to premiere in 2009-2010, and it is the only non-animated working-class domestic American sitcom currently in production as well as the only one set in Middle America.8 One might say, then, that for good or bad, in contemporary popular culture The Middle alone signifies familial life in the Midwest. Now, consider the current unemployment rate: nearly 15 million people, the majority of whom live in blue-collar Michigan (14% jobless) as well as other Midwestern states like Illinois (11.2%) and Ohio (10.9%).9 If we reconcile these two realities, we might conclude that it would be mighty irresponsible and potentially risky of ABC to depict its sole blue-collar husband/father (and family) in the negative manner of the traditional working-class sitcom. Indeed, having a bumbling, unthinking, incompetent man represent the multitude of out-of-work and undervalued Midwestern blue-collar males at this time, in this economy, in this job market would be unquestionably insensitive and out of touch. It’s just a shame that such a positive modification had to derive from such a dismal real-life situation. 1. The couch, fast food, and Dancing with the Stars: Dinnertime on ABC’s The Middle. 2. The Honeymooners’ Ralph Kramden, the original working-class buffoon. 3. Thanksgiving dinner, served up by Mike and the rest of the Heck clan. Also, in his 2003 article “Ralph, Fred, Archie, and Homer: Why television keeps re-creating the white male working-class buffoon,” Richard Butsch discusses the persistent images being produced by networks as a form of risk avoidance. He argues that networks often play it safe and that means staying with what works. So, you bring up an excellent question as to why the change. Why is Mike Heck a working class male without the qualities of being “dumb, immature, irresponsible, or lacking common sense” (Butsch as cited above). Could this change be a result of changing ideologies regarding gender? Could this show be breaking new ground and an attempt by ABC to take on a little more risk? The Middle premiered at the same time as Modern Family and Cougar Town. Perhaps this allowed them a little more leeway to test something new and if it failed the repercussions would not be as great with the potential of success with two other series to soften the blow of a failure? Thanks for reading — and for the kind comments! However, I didn’t go there, so to speak, for two reasons: first, I ran out of space (! ); second, if I had to choose one, the argument about the economy weighs more heavily, at least with this show anyway. For example, the two creators/writers of THE MIDDLE — both of whom are from the Midwest — have mentioned repeatedly in interviews that initially “interest [for the pilot] was lukewarm.” But then, they claim, “the economy tanked, and a show about a family struggling made it more relevant. […] This is a show about a family in the middle of the country that is not thinking about therapists or debating whether or not they have the right nanny.” More here: http://www.washingtontimes.com.....s-comeback. In other words, from its beginning THE MIDDLE appears to have been primarily anchored in concerns about our troubled economy. As Evan said above, a great and timely article, Kelli! Your article has me thinking about The Middle‘s more immediate antecedent, too: Malcolm in the Middle. While Bryan Cranston’s Hal was certainly not the intellectual superior in that family, I do remember him being the main caregiver in the family, which seems to fit with some of the characteristics of Mike Heck that you describe. Thanks, Charlotte! I have to admit that I’ve never seen MALCOLM IN THE MIDDLE. =( I’ll have to check it out sometime. The Very best sitcom on t.v. and maybe in the history of sitcom. I don’t know who writes for them but the subtle humor is incredible. I think you have to be a semi inteligent person to watch the show and when you discover that Fox News is the #1 News broadcaster in America it may signalthe death nell for Middle. First of all, the episodes are hit and miss, in my opinion to where I’ve turned off tv in the middle of some episodes. I’m not sure that this family is middle class. I mean, they can never do anything because Mike is too busy bitchin about his job and drinking beer in front of the tv. Anytime there is something in the house that breaks down, you can count on Mike to pass over it. Frankie is borderline mental hospital material. Yeah, they seem to love their kids, but it’s mostly about Axel at the expense of Sue and Brick. If I were married to someone like Mike, we’d have to have a talk about his lack of interest .